Color inversion is one of the new features that have been introduced in newer Android versions. To invert the colors in your phone, there is usually a quick setting button or shortcut that can do so. 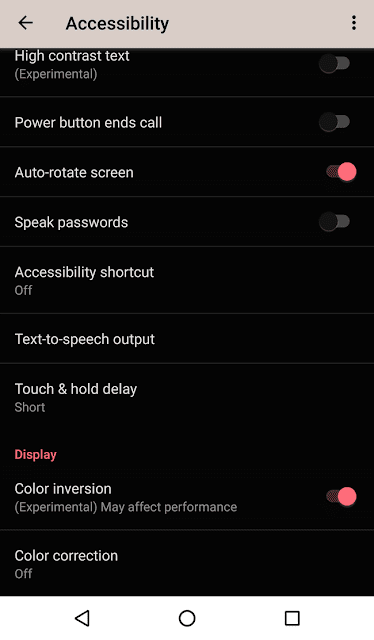 But if you cannot find the invert color feature in your phone and want to dig in a bit deeper to activate it, then you will discover it under the accessibility settings. The feature to display reverse colors is an experimental one. It might affect the performance of games and apps. So use it with caution. This experimental feature inverts your whites to blacks, red to green, blue to yellow, and so on. Inverting this way and using a darker scheme will allow your device’s screen to eat up less of the battery juice. It also increases accessibility and visibility for certain people. Go to the main Settings. 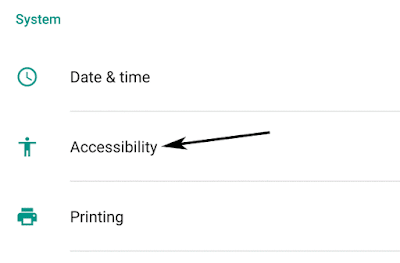 Scroll down to System > Accessibility and tap on it. Scroll down to Display and you will find an option called Color inversion. Tap and move the slider towards the right. The feature is turned on and you will see your screen color change to negative instantly. That means the colors are inversed, and the white background of your app drawer, settings etc. will turn to black. Similarly, the black text everywhere will now be displayed in white color. Everything is reversed color wise. Open one of your colorful photos and see the effect in its full form. Not everyone will prefer or want to keep this feature on. You can move the same slider towards the left to turn off color inversion. It will instantly switch back to the default color scheme and everything will appear natural.